The 45 GAP has won over some law enforcement agencies, including the New York State Police, for its strong case head that reduces the chance of blowouts into addition to its more compact design than the traditional 45 ACP -- but without sacrificing the power. 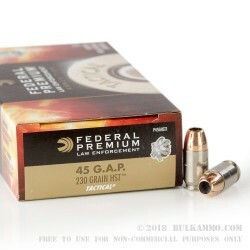 If you carry a Glock 37 for work or for personal protection, this cartridge by Federal is certain to satisfy with its 230 grain jacketed hollow point bullet. 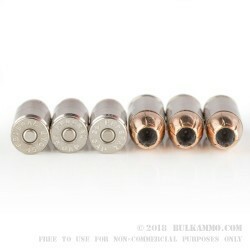 Its jacket will protect your bore against lead fouling in addition to promoting its penetration characteristics, and its hollow point will expand within your target to ensure it goes down as quickly as possible. 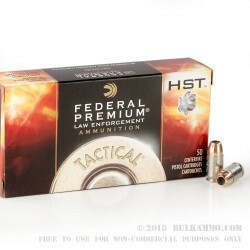 Federal’s HST ammunition was originally intended for exclusively law enforcement professionals, although it is now available to the public. HST ammunition’s bullets feature a cannelure in their shanks to mechanically hold their cores and jackets together. 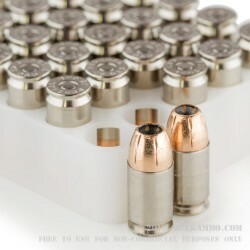 The result is a bullet that is significantly less likely to be stopped by barriers such as clothing, making this cartridge optimal for reliable self-defense.